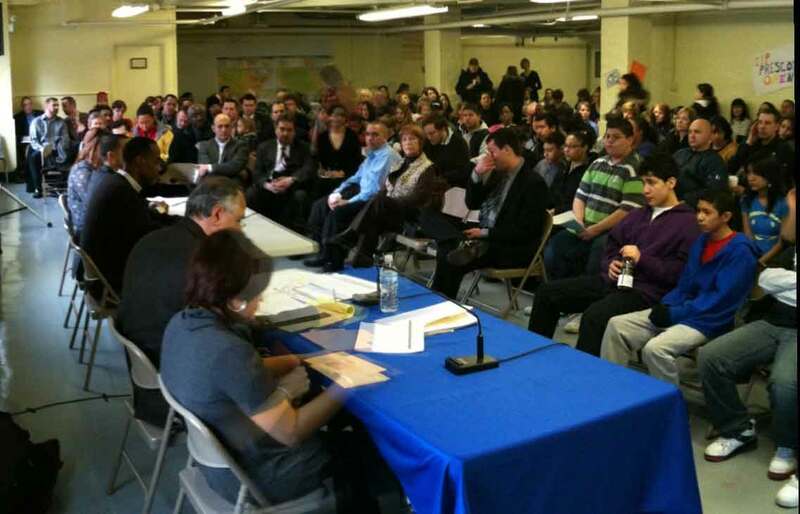 Parents, community members, and teachers packed Prescott Elementary's basement assembly room on Saturday morning, February 6, 2010, to plead their case for saving the school. Prescott is on this year's 'Hit List' and slated for closure due to what CPS officials call "under-enrollment." The event was the "community" hearing on the proposed closing of Prescott. Earlier, on February 3, a large group packed the Board of Education chambers at 125 S. Clark St. to bring the same message to CPS officials. Some of the more than 400 people who showed up at the February 6, 2010 hearing to oppose the Chicago Board of Education's plan to close Prescott Elementary School at 1632 W. Wrightwood on Chicago's North Side. Over two days of hearings on February 3 and February 6 more than 650 people turned out to speak in opposition to the Board's plan. Substance photo by Jesse Sharkey.Saturday's speakers made a strong case that the Board of Educatoni's justifications for closing the school are short-sighted and based on incomplete data. In particular, it seems clear that the school's neighborhood enrollment is growing. Prescott is located at Ashland and Wrightwood in a gentrifying neighborhood. There is a change-over going on in the school — all of the older students who spoke were Latino, the majority of the parents and younger kids in the audience — and there were many — were middle class and white. It is this changeover which underlies the earlier controversy surrounding principal Erin Roche and his attempts to 'flush' the faculty. Like a small number of other principals, Roche spent the first year of his term (he was picked by the LSC two years ago) apparently trying to purge the faculty of veteran teachers. The controversy has been reported at substancenews.net last year. Now everyone at Prescott — including the young Roche supporters — are being forced to fight if they want to keep their school and their jobs. Hopefully some will learn the lesson that teachers shouldn't be too quick to throw each other underneath the bus. Although the structure of the hearing does not allow for the cross examination of the Board of Education's witnesses, the Board's data and the credibility of the Board's presenters has been challenged at every one of the hearings held so far regarding the schools on the 2010 Hit List of CPS. Above, the hearing officer, Ed Santiago, is seated at the table second from rights, near Chief Administrative Officer Robert Runcie and other CPS officials who provided testimony on behalf of CEO Ron Huberman, who has proposed the closing of Prescott. Substance photo by Jesse Sharkey.CORE's Karen Lewis spoke at the event about the need for CPS to be accountable to the people their decisions effect — her remarks were well received. Chicago Teachers Union President Marilyn Stewart spoke also. There were so many speaker signed up to speak that the hearing officer did not get to hear from all of them. As in several recent hearings, he told the people who were not called to speak that they could call in their remarks by fax "for the record." Meanwhile, it is clear that the Board of Education is having a hard time getting it right, and the Board of Education faces a growing protest movement on all sides of the city. Prescott officials announced that 482 people had signed in for the hearing. The hearing was the fourth in the communities affected by the closings, and the 14th overall since the hearings began on January 28. More than 2,500 people have turned out for the downtown and community hearings since January 28, hundreds of them students, and some as young as kindergarten have spoken out against the proposed closings, turnarounds, phase outs, and consolidations. The final four downtown hearings are scheduled for February 8, February 9, and February 10. On February 8 there will be a hearing on the proposed turnaround of Dineen Elementary School at 5:30 and a hearing on the proposed "consolidation" of Wells Prep and Mollison at 8:00. On February 9, the hearing will be about the proposed "phase out" of Schneider Elementary School.